This impression in the sidewalk sent me on a chase for references to the name. On a rainy day before a holiday with not much going on, I remembered a name I had seen on an Albany sidewalk, and I wondered who that was. It was on First Avenue in front of John Boock’s art park at Lyon Street that I looked down instead of straight ahead. And there, I noticed a name and a date pressed into the concrete. I doubt that First Avenue had concrete sidewalks in 1907, so I’m either misreading the year, or 1907 signifies something other than the year it was imprinted in the cement. The name, Sprenger, is that of a large family in the mid-valley. At first I thought the first initial might have been an N. And if so, perhaps the inscription referred to Nicholas B. Sprenger. A website devoted to historical Oregon cemeteries says that N.B. is buried at the Masonic Cemetery at Seventh Avenue and Broadway Street. He was born in 1845 in Albersweiler, Germany, came to Oregon as a boy in 1852, settled (presumably with his family) just north of Shedd, and died in 1921. Albersweiler is a village in the southwestern German state of Rhineland-Palatinate. When Nicholas was born, it was part of Bavaria. About that time, timber resources in the surrounding mountains had been depleted and the population was growing, and a lot of people in the region left for the New World as a result. That may explain young Sprenger’s arrival in America. Some of this stuff has to be taken with caution. In 1938, Thomas Bird Sprenger told a WPA interviewer that he was born in Ohio in 1851 and that he was the son of Nicholas Sprenger of Albersweiler. Since Nicholas is unlikely to have become a father at age 6, something about these dates is not right. In February 1873, however, the Benton Democrat reported that the “fine residence of J.B. Sprenger, of Albany, was almost totally consumed by fire” on the previous Monday. The paper added that the home had been occupied by N.B. Sprenger and had been advertised for sale, “under a mortgage to the school fund.” Whatever that means. You actually have a fairly good source about this subject that you didn’t consult — me. You may remember my maiden name is Sprenger. I’ll have to ask my folks about the impression in the concrete, as I don’t remember what we know about it. There is this tidbit from the Portrait and Biographical Record of the Willamette Valley – Nicholas Sprenger was one of the organizers of the first Masonic Lodge in Linn county. I can, however, clear up a few things for you. There is a Nicholas B. Sprenger buried in the Masonic cemetery, but it is not father Nicholas. Father Nicholas, and his wife Maria, is buried in Crystal Lake Cemetery in Corvallis. Father Nicholas was born in Albersweiler, but in 1802. The Nicholas B. Sprenger buried in the Masonic is his son, who was born in 1845 in McConnelsville, Ohio. The family made the trek to Oregon in 1852, when my great-great grandfather (the man in the 1938 WPA interview) was just a few months old. J.B. Sprenger was another son of father Nicholas. I believe it to be the son Nicholas who was living in the house at the time of the fire. To my knowledge there are no K.B. Sprenger’s. I actually just checked and the Albany Democrat lists that it was N.B. Sprenger that had gone hunting with D.B. Monteith. I believe this is probably the answer to the name in the sidewalk. This is about the Nicholas buried in the Masonic cemetery. Nicholas was a plasterer and cement worker by trade. (“I remember the beautiful “plaster of paris medallions” he had made for the ceiling of the sitting-room parlor of his own home, and for Uncle Tom’s – much in vogue in the Victorian period, and being shown again today” – comment by MLL) The cement sidewalks around the old Linn County Court House in Albany were laid by Nicholas B. He was widely known in and about Albany as a reliable and skilled workman, and his services were much in demand. Nicholas B. was an active member of the Albany Elks Lodge. He served as their cook and regularly prepared dinner for the lodge, which was his hobby. I’m sorry, I forgot to cite my source for the information about him being a plasterer and cement worker. The information came from a family biography that was put together by Merle Lamar (a great-niece of Nicholas) for a family gathering in the 80s. Welcome to the reality of genealogy research. Misspelled names, Wrong dates, changed names, even on documents, such as census records, that you would think would be correct. Lots of luck and be prepared for disappointments. Happy Thanksgiving. The Elks Temple stood on that corner until destroyed by fire in 1979, according to the caption on the photo in Robert Potts, Remembering When, pg 19. There’s an electric trolley shown along with sidewalks and the circa date 1910. Cross reference to another: Linn County Memories The Early Years put out by the Democrat Herald last year has a similar photo from a different angle circa 1907. It’s credited: courtesy of the Albany Regional Museum, which houses the Potts photo collection. The Albany Regional Museum will likely have the answer to when sidewalks were put in but based on these photos, provided the estimated dates are correct, the date imprint could coincide with the original sidewalk alongside the Elk’s Temple. Albany Regional Museum is open for Small Business Saturday, Nov 26 from 10am-2pm. They have a great reference room and nice gifts for those who might like to delve into the history of Albany, Oregon. Could a Sprenger have been a shoe/boot vendor at a place near the mark? 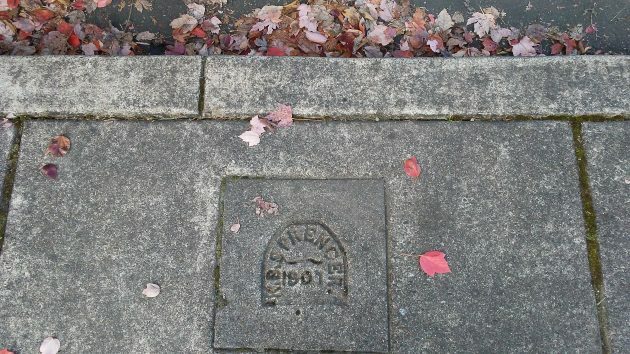 Concrete sidewalks were put in around the early 1900s. You can find several date stamps around town. First there were wooden walkways then concrete. All the while the streets remained mud. I guess womenfolk were fussier about mud than horses were. It is such a shame that the original concrete landscape is being destroyed over time. At least they saved the stamp in this spot.